Stepho’s Souvlaki Greek Taverna is a popular Greek restaurant on Davie Street. They are known for having massive portions and they often have line ups to get in. The inside of the restaurant is a bit dumpy and it looks like an outdated house with tacky Greek decor. I was shopping downtown and I decided to try Stepho’s because I have avoided it for so long because I hate waiting in lines for food. 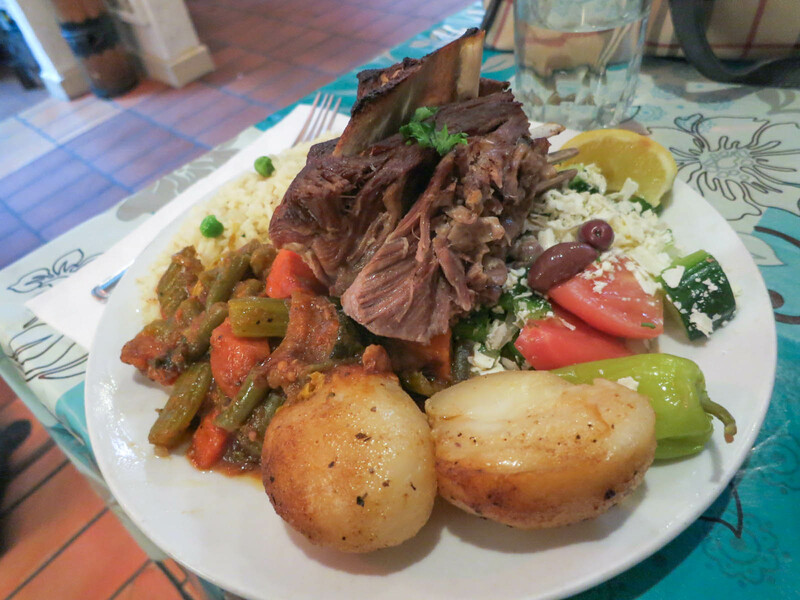 I had the roast lamb platter ($10.95), which comes with rice, potatoes, Greek salad, and roasted vegetables. The lamb was great and it lived up to what I had heard. The meat was falling from the bone and it was tender, juicy, and flavourful. Unfortunately, it all went downhill after the lamb. The roasted potatoes were okay, but didn’t have a ton of flavour. The Greek salad was dry and also seemed to be lacking something. The roasted vegetables weren’t necessarily bad, but they weren’t anything special. The thing I had the biggest issue with was the rice, which should be a simple, straight forward item. They put frozen peas and carrots in the rice. This didn’t seem very “Greek” to me and no restaurant should ever use frozen veggies. Period. The meal also came with a pita, which had burnt spots on both sides. I would have complained, but there was so much food that I didn’t need the pita anyway. I was disappointed in my experience at Stepho’s and I doubt I will ever return. It makes me sad to see such an overrated restaurant so busy when there are so many great restaurants in the city. The lamb was good, but not good enough for me to want to eat the rest of the crappy food and wait in line for it. The service here was also not very good because the poor waitresses had way too many tables, so it took forever just to place my order. If you want quantity, you can get it here, but if you would rather have quality food and service you should look elsewhere. No, the food and service here is mediocre. It’s definitely not worth waiting for! What are some of your favourite inexpensive greek restaurants? I wish I knew of a good place, but I don’t have any favourites. If you have a recommendation, I would love to hear it! the greek place right next door is much better and you don’t have to wait! Stepho’s has gone downhill for awhile now, the last 3 times I’ve tried it in the past year have been progressively worse. And the last one, my roast lamb tasted terrible. I don’t know if the owners or cooks have changed but it’s just gotten a lot worse. Even the salad doesn’t have all the ingredients it used to. I’ve heard the one beside is not bad, hopefully you can review that one. Yes, the one next door is better! Yummy yummy yummy!